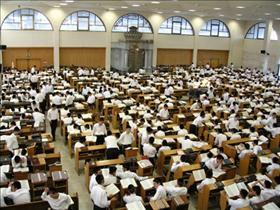 Hiddush - What do draft-dodging and the national budget have in common? What do draft-dodging and the national budget have in common? The "draft-dodging" bill is being demanded by the ultra-Orthodox political parties, lest they topple the government and force new elections. This past week has repeatedly tested the nerves and blood pressure of Israel’s politicians and provided headlines for every news bulletin and media outlet for days on end. It all evolved from the Haredi parties’ demand (particularly Health Tzar MK Yaacov Litzman who represents the Gur Chassidic Court in United Torah Judaism party) that a new bill be passed as a condition to passing the national budget. This draft bill was appropriately and accurately labeled by Defense Minister Avigdor Lieberman as the "Draft-Dodging Bill", which he vehemently (and rightly) refuses to support. It all seems to lead to an early demise of this government coalition and new elections soon. The crisis was averted at the last minute, not by finding a solution but rather by what we called "A masquerade ball" in an op-ed this week. Everybody agreed to play nice for a little while, so as not to bring down the government quite yet, understanding that they are voting for a bill which would ensure that no yeshiva student will be drafted if he doesn't want to serve. Still, the bill will go through drastic changes before it becomes law. There is no agreement on how to square this circle, but the crisis was postponed by a few months because the chasm between the Haredi demand to give up on drafting yeshiva students and the Supreme Court ruling that equality must be upheld cannot be bridged. In short - a cynical game and an ugly display of masks and media spins. It is clear where the public is regarding this clash, including the constituency of the non-Haredi parties [see details of the recent Hiddush poll], but in the business of political horse-trading this has limited impact. The fear of public retribution given in the election polls brought the politicians to vote for an untenable bill, claiming that it will be neutralized before the final vote. In short - a cynical game and an ugly display of masks and media spins. It is just a question of time, then, until the next crisis occurs, anchored again in the unholy alliance of religion and politics in Israel, because the agreement reached between the parties explicitly allows the Haredi parties to repeat their demands for religious legislation if and when the Supreme Court rules on any of the religion-state cases pending before it (conversion and the Kotel controversy being only two examples). There is little doubt, for instance, that the Court would be ruling in favor of the petitions submitted on behalf of the non-Orthodox converts; and there is little doubt, therefore, regarding the next crisis. It will happen sooner rather than later, and it will again focus on the clash over religion and state, and it will again feature the void between the theocratic demands of the Haredi parties and the core principles of democracy and religious freedom as upheld by the Supreme Court and embraced by the overwhelming majority of Israelis and world Jewry. Stay tuned, share with your friends, and sign on to the Vision Statement on Israel as a Jewish and Democratic State.